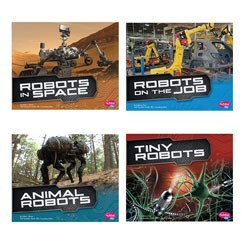 Got a robot-crazy kid? Then this just might be the perfect collection of books for her (or him). The Cool Robot series looks at robots used on earth, in space, and underwater. Some engineers get their robot-inspiration from animals. For example, fins and fish tails might be the perfect thing to help steer an underwater robot. Some animal-robots are toys, while others are working bots, like a robotic fish that searches for pollution in the ocean. You already know one robot that works in space: the Mars rover. But did you know that astronauts use robotic gloves to help them grip tools better? And all those unmanned probes flying though space to Mercury, Pluto, and beyond – they are robots, too. Soon there might even be a robotic astronaut. If you’ve watched car ads, you’ve seen factory robots. There are even restaurant robots that make sushi. But did you know there are robots that work in hospitals? Remember that science fiction book where people are shrunk and sent inside the human body in a tiny submarine? We’re not there yet, but scientists are working on a pill-sized robot that can be swallowed and will take pictures inside the human body. They’re also working on nanobots – robots too tiny to see. Someday nanobots might be used to fight disease. 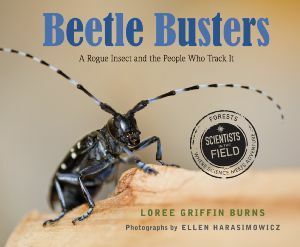 One of the newest in the venerable Scientists in the Field series, Beetle Busters: A Rogue Insect and the People Who Track It by Loree Griffin Burns and illustrated by Ellen Harasimowicz is very topical. The Asian longhorned beetle is an invasive pest that attacks numerous kinds of hardwoods in the forests of eastern North America. It came to the New World in wooden pallets in 1996 and has been the focus of an ongoing eradication program ever since. Budding entomologists are going to find this book fascinating. It contains information about the life cycle of the beetle, the history of its introduction to North America, details about how scientists are studying the insects, and information on how concerned citizens can get involved. Burns also reveals how cutting down trees changes habitats and some evidence that ecosystems can recover eventually through succession. In her Author’s Note, Loree Griffin Burns admits that she questioned whether attempting to eradicate the beetles from her community in Massachusetts by cutting down and chipping many trees was going to be a successful tactic. In an effort to find out more, she gathered the materials that would eventually become the book. For a more, see Growing with Science blog and Sue’s previous review here at STEM Friday. Categories: Science, STEM Friday round-up | Tags: Beetle Busters | Permalink. If you’ve never heard of a fractal, then this is the book for you. Sarah Campbell begins by looking at simple shapes around us: cones, cylinders, spheres, rectangles. Then she moves on to things in nature that don’t have perfect shapes. “Instead of being straight, smooth, and flat, many natural shapes are rough, bristly, and bumpy,” she writes. True enough when you’re looking at a head of broccoli, a fern, or even a tree. Before 1975 no one really had a name for these shapes. Then, a mathematician named Mandelbrot noticed something interesting: these shapes had repeating patterns. For example,. A tree starts with a stem that divides into branches, which each divide into branches, until the very last and smallest split into twigs. He called these patterns “fractals”. 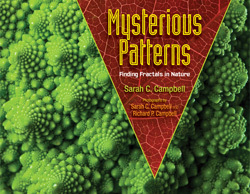 In her book, Campbell provides photos of different kinds of fractals. Then she provides a DYI “make your own fractal” activity and ends with a biographical sketch of Mandelbrot. Head over to Archimedes Notebook for some beyond-the-book fractal activities. 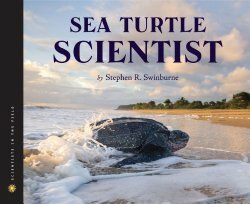 Sea Turtle Scientist (Scientists in the Field Series) by Stephen R. Swinburne will make you want to hop on a plane and fly to the Caribbean to become a sea turtle scientist. Really, it is that compelling. The book reveals Dr. Kimberly Stewart’s efforts to investigate and conserve sea turtles on the Caribbean Island of St. Kitts. Talk about a tough place to work (wink). Actually, it isn’t all sunshine and beaches. Much of Dr. Stewart’s research is carried out at night when the female sea turtles come to the beaches to lay their eggs. Because she can’t use regular lights, she and her team must use red head lamps and try not to trip over turtles or their nests. Dr. Stewart is also working to help save leatherback turtles, which are endangered. Once again, her work isn’t for the squeamish, as she gathers data from sea turtles killed by poachers. Still, she is able to make a difference and educate others about the importance of sea turtle conservation. Sea Turtle Scientist would be useful for units on oceans, reptiles and the importance of conservation. It is also a perfect book for budding marine biologists and veterinarians, alike. For my full review of Sea Turtle Scientist, see Wrapped in Foil. For related information, activities and links to lesson plans about sea turtles, see Growing with Science. Sue also reviewed this title here at STEM Friday a few months ago. Categories: Science, STEM Friday round-up | Tags: Sea Turtle Scientist | Permalink. 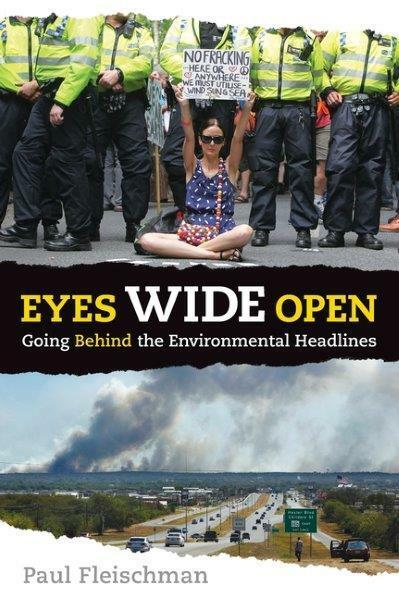 Growing up with the first Earth Day, the birth of the EPA, and an emerging corps of environmental journalists it was no surprise that I ended up writing about science and environmental issues. This book could not come at a more critical time! And Fleischman does a great job of wrangling a huge amount of information into six readable chapters (plus scads of material at the back). Science is only part of the environmental story, he warns us. Turns out money is just as important. Where science tells us what nature is doing, money explains what people are doing. And “power and politics are bound up with money”. Fleischman discusses Vested Interests, power, and politics. He talks about complexity and uncertainty, and how lobbyists can use those to sow doubt and prod people into denial about environmental problems. He shows how groups pouring money into pro-polluting campaigns can hide their identity and how language is used to instill fear. Take, for example, the labeling of protestors as “eco-terrorists”. With the use of one word, people peacefully protesting pollution are suddenly stripped of their rights to protest and treated as criminals. One issue Fleischman raises is conflict caused by environmental stress. Climate change can bring too much rain and flooding to one place, too little rain to another. Drought-induced food shortages can create political conflicts as people leave their farms and try to move elsewhere. As arctic ice melts, the Arctic Sea could become a battleground between nations vying for oil and gas or other minerals now accessible. Understanding the problems is important – but learning how to judge the media and weigh the information you uncover is vital. Fleischman includes a great guide on how to judge websites, print media, books – and even the journalists publishing the news. He gives readers the same tips editors give their cub reporters: Follow the money; beware of “mental” vested interests; and check for fallacies. The camera can lie, he says. Back matter includes source notes, bibliography, resources, glossary, and a handy index.